A violent homage to Dutch master Rembrandt is the starting point for a new series by Paulo Climachauska. The desire to criticize today’s world is at the core of Climachauska’s fascination with the interrelations of economy, society and art. 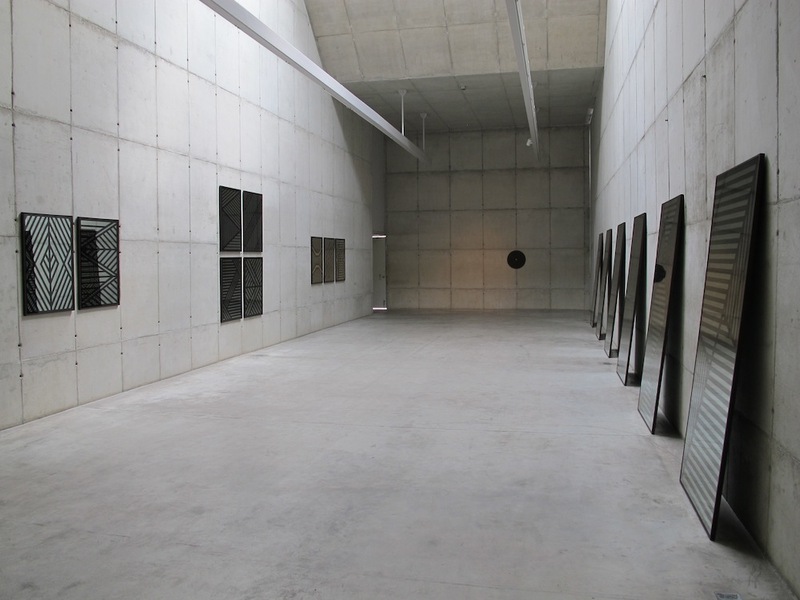 This urge is central to his first exhibit in one of São Paulo’s finest galleries, Galeria Leme, headed by Eduardo Leme and housed in two soft velvet-grey cement cubes by Pritzker-winning architect Paulo Mendes da Rocha. The series of eighteen works, titled “Night Watch,” hails the large, iconic Rembrandt painting of the 1640s, which evokes a local militia monitoring Amsterdam, commissioned by the Town Hall and, since 2013, at the Rijksmuseum. Rembrandt’s painting is at the heart of this solo show of the São Paulo-born artist of Lithuanian origins in his attempt to relate the mystique of bygone times to the present, which in this exhibit is his criticism toward our over-monitored society. Paulo Climachauska, “Night Watch” installation. 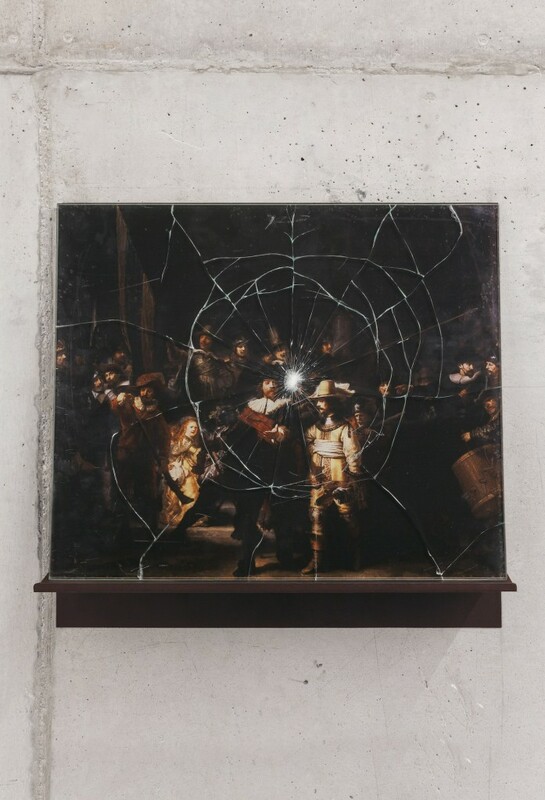 A reproduction of Rembrandt’s painting, at a fraction of the original’s size, is topped by Climachauska with anti-vandalism adhesive film on ballistic resistant glass, and cracked by a bullet. The impetus for the show, however, was ignited when Climachauska’s eye caught the striped design of the heavy gates of the condominiums that abound in São Paulo’s neighborhoods, rich and poor alike. 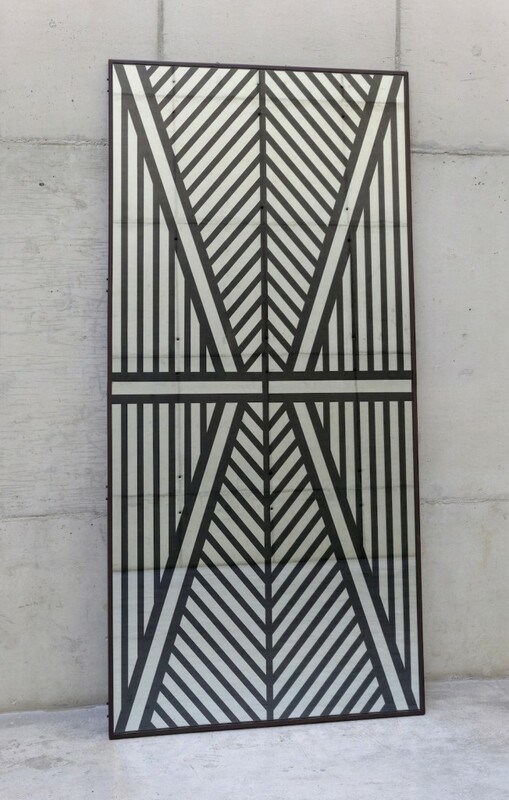 This led him to develop the group of iron-framed rectangular mirrors striped with dark-tinted protective adhesive that literally reflects the caged life of Brazil’s bullied contemporary society, intimidated by social, moral and political violence. The artist binds his vehement comment on the paranoia of surveillance and the cacophony of control devices on Rembrandt’s clever critique, the depiction of the militia in the wealthy, fearful, seventeenth-century century Amsterdam. Among the artwork is also an outdoor sculpture-installation composed of eight two-meter high pedestals in a circle topped by convex surveillance mirrors coated with safety film cut like the eight phases of the moon. Titled “Eclipse,” it creates a direct link to the round dark brown panel centered with only two small coins, one halfway on top of the other—a U.S. dollar coin topping Brazil’s real—a critical yet subtle note on financial power, another theme dear to this artist’s elegant critical esthetic. “Night Watch” shows through June 13 at Galeria Leme, São Paulo.